Hey babes! Pretty excited to be sharing another amazing Nordstrom Anniversary Sale favorite with you guys. 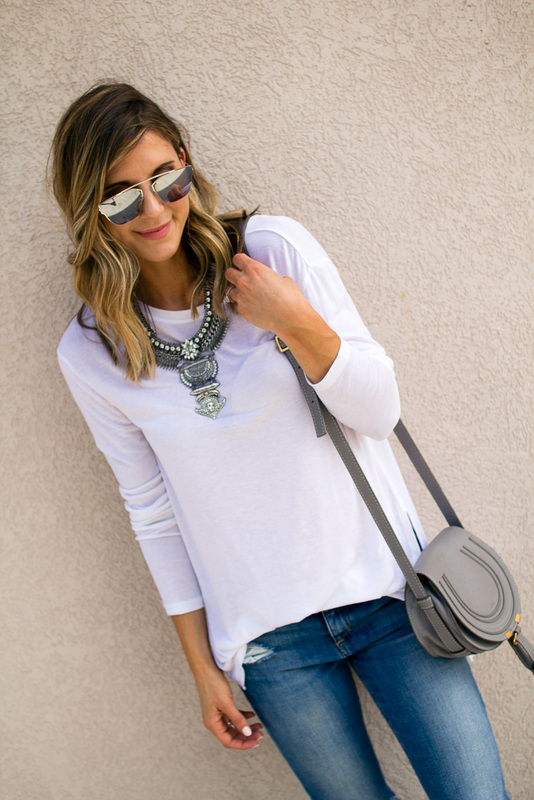 This basic (but not so basic) long sleeve tee is so perfect. I love how soft it is, the length and the side slits. Wear this tee with jeans, leggings, cut-offs, however you want. It’s long enough you can even knot the front or back to add a fun detail. I love pairing a basic top with a statement necklace or earrings and heels for a not so basic look. Perfect for date night or drinks out with the gals. I did size down and am wearing an x-small. As always, thanks for taking the time to stop by. Love you guys! More Nordstrom Anniversary looks here, here and here. I ordered this exact shirt! It looks pretty thin-what do you recommend wearing under it?